Home» AP LATEST UPDATES | AP Mid Day Meals News. 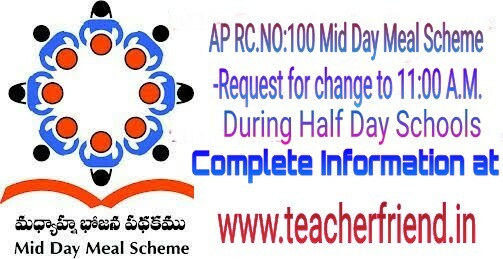 » AP RC.NO:100 Mid Day Meal Scheme-Request for change to 11:00 A.M During Half Day Schools. AP RC.NO:100 Mid Day Meal Scheme-Request for change to 11:00 A.M During Half Day Schools. AP RC.NO: 100 Mid Day Meal Scheme-Request for change to 11:00 A.M ; AP Mid Day Meals timings during half day schools to 11.00 am as per RC.NO: 100 ; AP change the MDM timings during the half day schools to 11.00 am so that the children do not remain hungry for a long period of time as per RC.NO: 100 ; AP RC.NO: 100 Mid Day Meals timings during half day schools to 11.00 am. AP RC.NO:100 Mid Day Meal Scheme-Request for change to 11:00 A.M During the Half day schools. AP Rc.No.100/MDM/2013, Dated:06-04-2016, Mid Day Meal Scheme-Request for change of Mid Day Meals timings during half day schools to 11.00 am so that the children do not remain hungry for a long period of time and For the schools where examination centre for SSC Examinations Centers are there, the MDM is to be served before starting of school i.e.,scheduled for 1.00 to 5.00 P.M. working hours as per Govt. Memo No.8220/SE-Prog.I/A1/2013, dated: 26/03/2013. The attention of all the District Educational Officers in the State is invited to the reference read above and they are instructed to change the MDM timings during the half day schools to 11.00 am so that the children do not remain hungry for a long period of time. For the schools where examination centre for 10th Class exams are there, the MDM is to be served before starting of school i.e.,scheduled for 1.00 to 5.00 P.M. working hours.